This weekend was a hot one. Humid, upper ninety degree weather mixed with random thunderstorms and sudden gushing downpours. Most of the time it feels like you are strolling around in a steam shower. Swimming is a better word. Thick heavy air, wet and soggy. It's enough to make even the most enthusiastic outdoorsy person retreat with a grumpy huff to a nice air conditioned building. Ah, August in DC. Not my favorite month in our nations capital. But summer is also a time for exploration. Vacation. Even in your own backyard. My husband and I are always thinking of weekend 'adventures' to have here in DC to fight our "we miss NYC" fatigue. I love DC, don't get me wrong, but the energy level can certainly be less vibrant than New York - which can be nice at times as well. Yesterday, for our adventure, we took the Metro out to Eastern Market. I have been meaning to go for the past .. 5 years or so .. and so finally it happened. Eastern Market, completed in 1873, was designed by a German-born immigrant named Adolf Cluss. In 2007 it was victim of a horrible fire - but in the past few years has gotten back on its feet quite well. This public market carries goods of all sorts in various indoor and outdoor venues. Market. You step off the Metro and walk a few blocks to the central market area. The US Capitol building right in view. It was hot, sticky, the crammed vendors looked not so cheerful to be sitting out in almost triple digit heat. But still, plenty of DC-ers scurried around the market buying art, produce, bohemian-style clothing, sparkly handmade jewelery, some clever crafts and some furniture. Compared the the outdoor and indoor markets in NYC (Essex, Eataly, Union Square Farmer's Market, Brooklyn Markets), I was pretty underwhelmed. 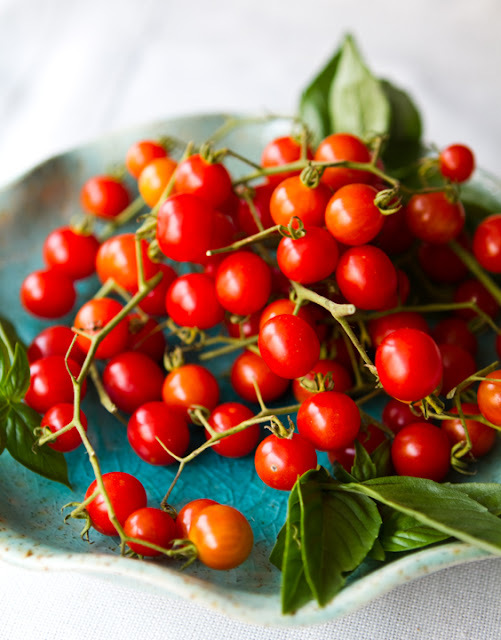 However, I was glad we went - and I did manage to pick up some gorgeous summer tomatoes, peaches and peppers..
As we were leaving, I managed to get stung by something - on my foot. Or maybe it was a painful heat blister, not sure. But it hurt! So we wandered into a little espresso cafe and picked up two soy iced lattes. I didn't realize how overheated I was until I gulped down that chilled icy coffee. Out of the corner of my eye I spotted a display of confections. 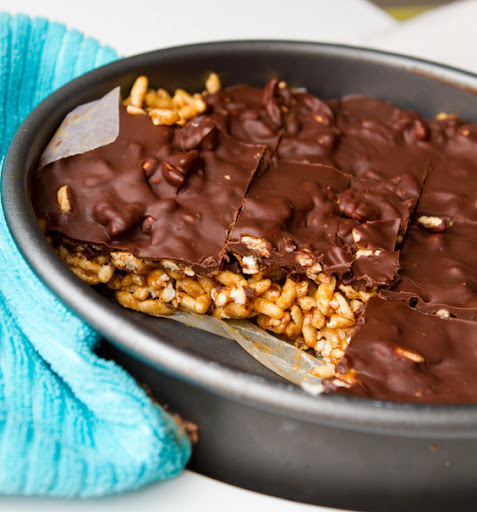 Brownies, cookies and then these gorgeous peanut butter chocolate rice bars wrapped in shiny cellophane. Not vegan. So I went home and made some veganized bars of my own. Perfect cool "icebox dessert bar" for a warm summer day. This recipe is quite easy. 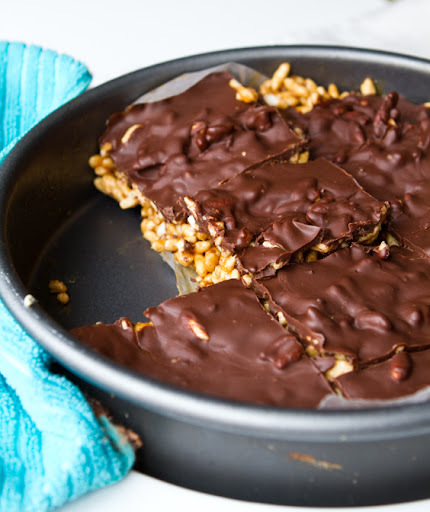 You can whip these bars up in under twenty minutes and not even have to turn on the oven. You can soften the vegan butter and peanut butter in the microwave and melt the chocolate on your stove top with a double broiler. 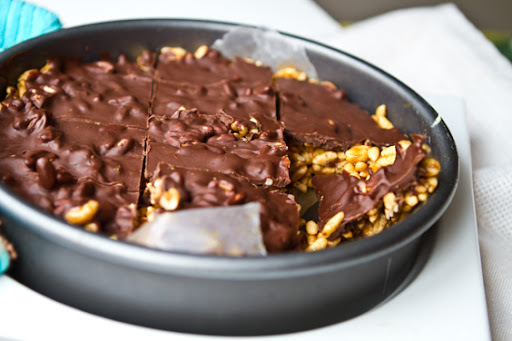 Then chill for at least an hour - I put my bars in the freezer to speed things along. And serve! 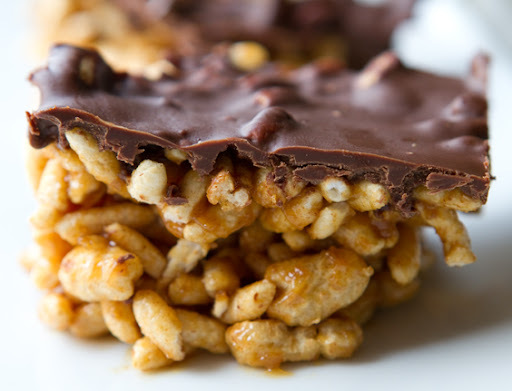 And also, I used "puffed" cereal which made my bars more tender rather than "crispy" - if you want a crispier/crunchier bar, use crispy rice rather than thick puffed grains. 1. Combine the maple syrup, peanut butter, vanilla and softened butter in a large mixing bowl. You want to have a thin liquid mixture. 2. 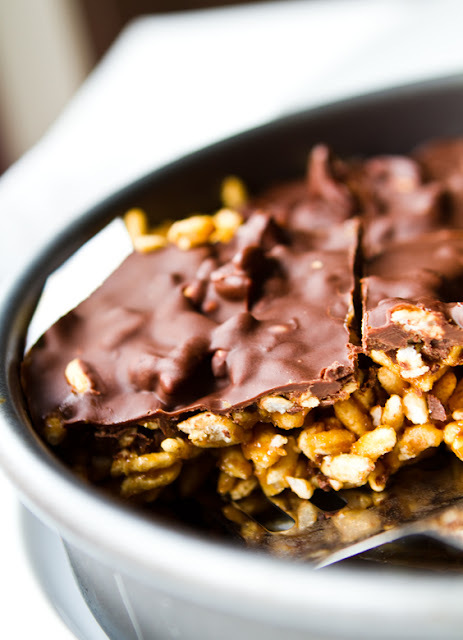 Melt the chocolate chips - with the oil and sea salt - on your stovetop - or very carefully in your microwave. 3. Add your rice and kamut crisps to your butter/maple mixture. Fold until all the crisps are coated. 4. Pour your crisps into a wax-paper lined dish. Flatten with a spoon. 5. Drizzle the melted chocolate over top. Note: You can also double the chocolate amount and do a top and bottom later of chocolate. 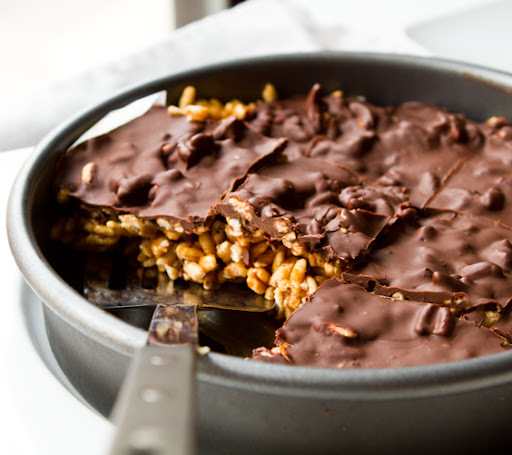 Or you can even fold the chocolate right into the crispies to create true peanut butter chocolate crispy bars. 6. Chill in the freezer until hardened. Store in the fridge.